And eventually I was able to meet some of the main authors I was reading at that time, e.g. Willard McCarthy (picture during his talk in Cologne) at a conference with invited speakers only organised by Manfred Thaller one of the advisors of my PhD thesis: the Cologne Dialogue on Digital Humanities, which is meant to be a starting point for further conferences and for institutionalising eHumanities in Europe. Nice coincidence: coming backing to one’s roots but being able to join the ends of a story. 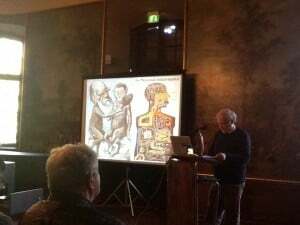 The conference held in the nice 18th century manor of Cologne Wahn (yes, near the airport) was organised such that two experts were speaking on the same aspect of the eHumanities but from different angles. Seven topics were addressed. My part was being a non-technical counterpart to Ed Fox, whom I consider being „Mr. Digital Library“. One of my first courses I gave in Potsdam took his book as textbook. So: what a burden! On the other hand I sort of replaced Stefan Gradmann, which was a challenge too. I hope I could or can contribute to this debate. Unfortunately Ed Fox could not come to Cologne being seriously ill. The intention is that on the CCHE Website the discussion will be continued. So please stay tuned on the „controversy on Digital Libraries“ there or post a comment on my text here – if you want. I am writing in English here in order to enable the workshop partcipants to understand this post too. In my paper I address the question whether Digital Library engineering is able to generate knowledge or if – more fundamentally – Digital Libraries as they burgeon everywhere now make any sense at all. This entry was posted in Tagung, Vortrag and tagged Digital Library, eHumanities, Informationswissenschaft on 25. April 2012 by Hans-Christoph Hobohm.